It's a house, with his garbage people on it and even a pretty flower out front (his words). I guess he told Husband that he was going to wake up to show me his house, and he did, he totally did. Wade found a Thor Pez dispenser this week and he called it Jesus - he really wanted the Jesus/Thor Pez dispense and I had a really hard time saying no. He's also made up a song that I'm assuming is called Jesus Christ, cause the only lyrics are Jesus Christ sang over and over again - occasionally there's something about his birthday or how he loves him or something similar. he starts pulling down his underwear and then has to run to the bathroom with them around his knees. Double time out. Nana and Papa came in town this week and everyone had so much fun - but also so many fights, cause everyone was going at 100 mph and wanting all the attention and being overall excited and exhausted. We also went down to the family farm for New Years Eve (we got there the day before NYE and left on NYE). It was so cold that I kept having to scrape the inside window of our car so Husband could see outside (mostly cause Stella is such a nervous car rider that she kept breathing heavy on the window. Dumb dog). There were two adults to every little kid, which made the whole trip so worth it. 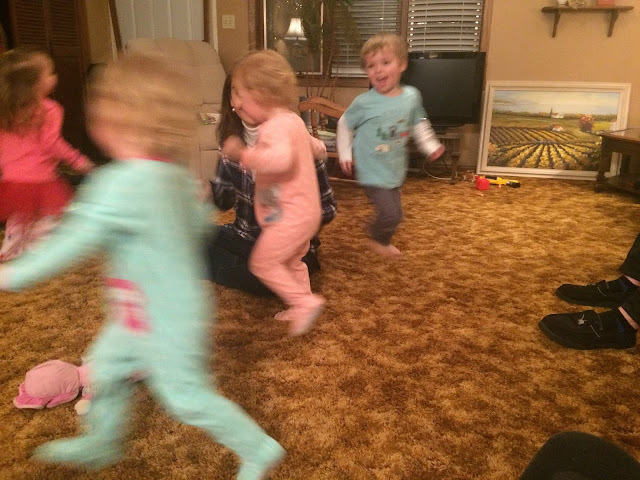 There was a lot of "running of the children." All my kids love Aunt Karen. Both her and her husband, Dave, have this pull on my kids. I love watching it. Jacqueline was certain that Karen should be holding her. Always. Blake discovered that Jonathan needed to work on his legs. We did a little gift thing - it was supposed to be a game, but they were all to young to get it, so they just ripped open some silly little gifts. Which, they loved. And I now have another batch of stickers all over my house and bunch of little toys everywhere. Woohoo. Then we got home and four hours late had 30 people at our house for an impromptu New Years party! One friend brought over decorations she impulse bought and we threw up a picture booth. Then we took pictures. We had so much good food! People were playing pool and watching a movie downstairs, there were games, food and video games upstairs. Then kids running around and filling in all the cracks. The build up to midnight was so loud and fun - the buzz was wonderful. I don't think I've ever had such a fun New Years! It helped that my girls were in bed before anyone got there, then Wade was down before midnight. Then 15 minutes later everyone was headed out the door and we were in bed by 12:30. My kind of people! Cause, as I said, my girls went to bed at their normal time, so they woke up at their usual time. I got to get up with them, but took an amazing nap later - so it was a great trade off. She's such a weird human. She's been climbing on the table and counter more and more. I continuously tell her to get off, but she doesn't listen to me at all (she kinda listens to Husband), but all her meals are now taken sitting on the table. Guess that's her happy place. She's also been getting stuck on the counter cause someone will move her chair or she tried to get off in a place that her chair isn't under her - lots of self made problems. Jacqueline is a little hulk. Too bad her favorite color isn't green (she'll tell you it's pink, with great intensity). We've been building a lot with these little magnetic tiles (in the first picture of this post) and she jumps next to me the whole time I'm building saying, "Smash, mash! Smash!!" and then I'll tell her to knock it down and she'll jump on them with such gusto! Little stink won't make her own towers, she just wants to destroy others. Oh man, I just remembered that she did make a tower today and was carrying it around and Wade was on his way to the bathroom and had to detour and knock it down (kids are jerks). He got put in time out, and now I'm realizing that it was probably just pay back. I've been getting lots of headaches and have had several migraines this last month, it's exhausting. I've been stretching and doing yoga. I'm still sleeping sans pillow. I've been trying to drink more water and now that the holidays are over I'm trying to eat less sugar. Feeling a bit at a loss of how to get them back under control. But also feeling good about cutting sugar, just wish I could feel amazing and eat what I want and have a perfect life. But we've been having so much fun here, but ready to get back into a schedule! Isn't that the truth for January? Wanting to reorganize, start fresh, clean out - I'm just resisting a huge urge to buy more storage totes and such. Maybe headaches are a good thing, they keep me in.